If you take apart PSG, Ligue 1 is very interesting this season. Though the club capital is more than 10 points above its contender, there are still competitive issues both at the top and at the bottom of the table. Here we will talk about a big game in France, which counts for the Champions League places, but there are important and surprising issues with relegation teams, with Metz coming back from nowhere. With Lyon, Marseille and Monaco battle for the 2nd place. The game we will describe here is one of the most competitive game this season, with two teams of the same level both needing a Champions League place. This game ended by a draw (2-2) in a very special way: 2 goals within the ten first minutes (Monaco then Marseille) and 2 goals at the 47th minute (Marseille) and the 51st minute (Monaco). 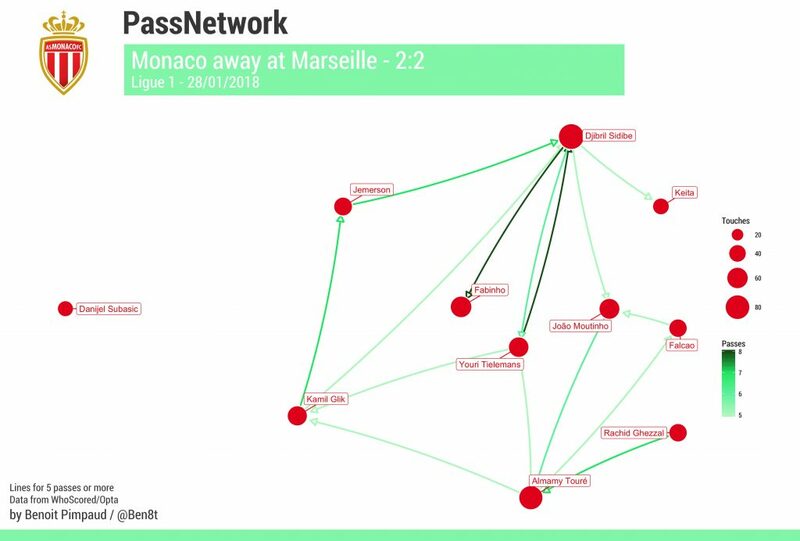 Marseille had the ball most of the time but Monaco was very efficient to block opportunity in the midfield and build fast and accurate after gathering the ball. At the end, this draw does not settle anyone except Lyon who remains in competition for the second place. It is without big injuries that Marseille came to play that game. In a good shape since some games now, Rudi Garcia chose to align a strong team either in attack and in defence. With Rolando and Rami as centre back, Marseille defence lacks speed but it’s still very strong. Beside there are Sarr and Sakai who confirmed their involvement and their preponderant role both in the defensive and offensive phases. They are not big names in the football circus, but they are very underrated players and if Marseille continue its good performances, they should attract big clubs. The midfield was composed by Luis Gustavo and Morgan Sanson with Dimitri Payet as playmaker. In fact Gustavo played as deep playmaker, just in front of his centre-backs, Sanso playing very high and Payet taking the left wing (see passmaps above). On that side, Lucas Ocampos was not very efficient. He has been replaced just after the beginning of the second half by André-Frank Zambo Anguissa, a strong midfielder, letting Sanson played higher and Payet free of defensive charges. There were more wounded in Monaco side. back from the infirmary, Jemerson was not in full possession of his means, that was seen on Rami’s goal in the seventh minute. But the real absent was Thomas Lemar, suffering contusion on the left thigh. However, the rest of the build-up was usual. With Falcao at the forefront, helped by a sharp Keita Balde and a smooth Rachid Ghezzal, Monaco attack was very dangerous, moreover with the pressing set in place by Jardim. With Fabinho and Tielemans, the midfield is balanced, in front of a good defense a little bit readjusted with Sidibe on the left – he usually play on the right side – but this position doesn’t bother him at all. 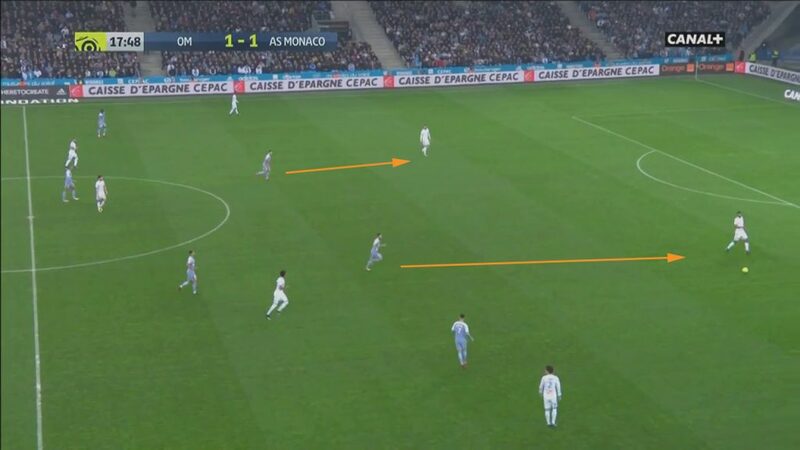 With Gustavo playing as a deep-lying playmaker, sometimes looking like Marseille play with 3 centre-backs (a little bit like Fernandinho as Manchester City), Jardim was very smart to ask his forward players to press a lot when Marseille would try to build-up from the back. This pressing was very efficient, preventing Gustavo to make the first pass and thus leaving no choice to defenders if not to clear the ball. Furthermore, Monaco reach to keep this pressing all along the game, helped by a midfield very enduring with Fabinho and Tielemans. 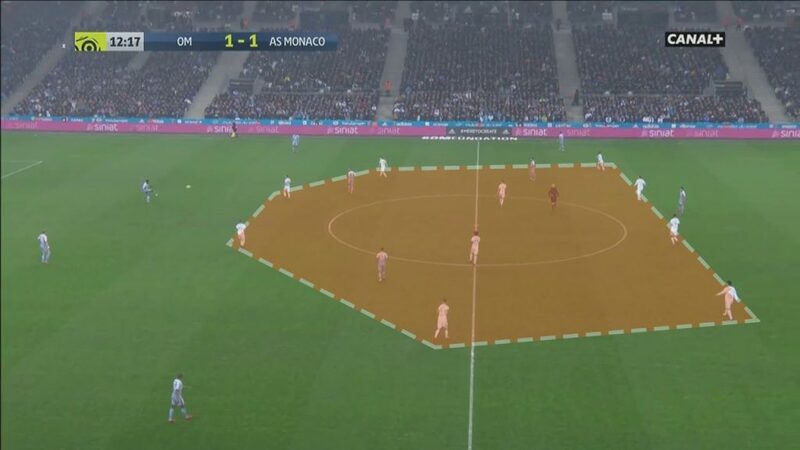 To avoid Monaco trend to counter attack, Rudi Garcia probably asked his players to stay compact. 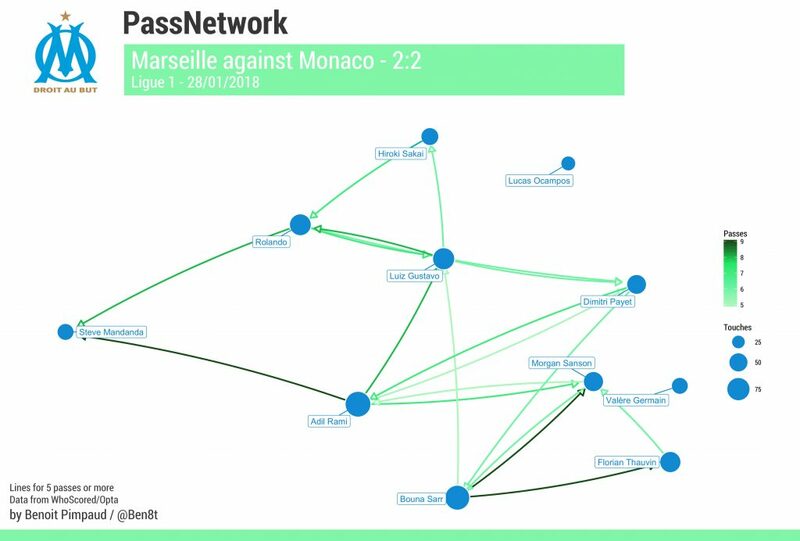 This solidity was at the end prolific for the two teams : the pressing of Monaco forced Marseille to play on the sides and player density forced Monaco to splay its game. Therefore, the 4 goals and the majority of the actions have all come from the sides. If Marseille stays on 7 games without defeats, they maybe rely too much on Thauvin, Germain and Gustavo to make differences. Injuries could happen and difficulties stay at this level with them. Moreover Marseille has to confront PSG, Nantes and Lyon in a very close time, a series that should determinate the end of season for the Marseillais. For Monaco it’s a hollow season while they probably recast the team during the summer. After selling Mbappe (PSG) and Mendy (Manchester City), it will be probably the turn for Sidibe and Lemar who are already sought by other big clubs. Like usual, Monaco have already expected these possibilities, investing on several young including a 16-year-old Italian for 20 million euros.